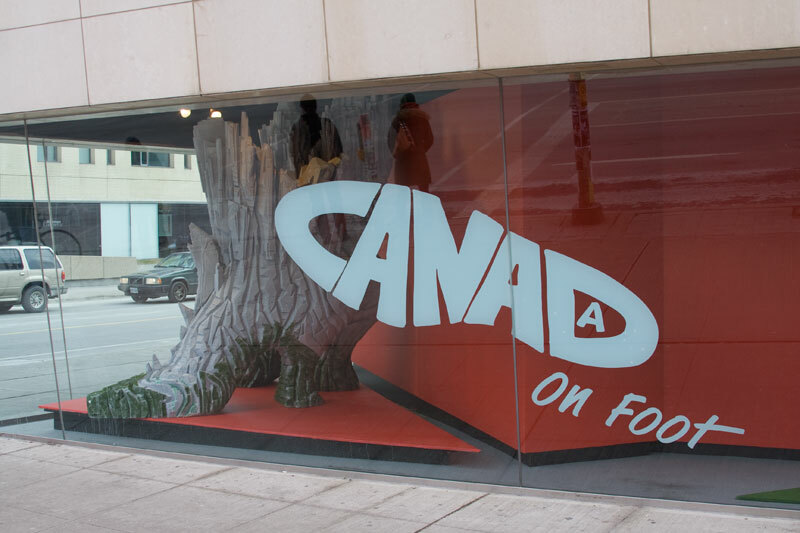 Here’s an eye-catching sign on the display window at The Bata Shoe Museum. The six letters of “CANADA” are snugly fitted together to form a gigantic footprint. What does this puzzle-like graphic say about our national identity? I can’t get enough of that little A contained inside the D! It’s a quirky response to the fact that the D makes a good heel, but unfortunately isn’t the final letter of the word. Imagine stomping through fresh snow with treads like this on your boots! This entry was posted on January 25, 2010 at 4:33 pm and is filed under Uncategorized. You can follow any responses to this entry through the RSS 2.0 feed. You can leave a response, or trackback from your own site. Thank you for your contribution, Major Callisto. Much appreciated!